Do the earrings come with backs? All earrings are sold by the pair and come with backs. If you need additional backs, one can purchase them on our website. First Class Mail shipping is free, no minimum. All orders are processed within 24 hours unless told otherwise. We are closed on Saturday and Sunday. All orders placed Friday night through Sunday will be shipped on Monday. First Class Mail shipping – Approximately 2-5 business days. Priority Mail Shipping – Approximately 1-3 business days. Express Mail Shipping- Approximately 1-2 business days. Why should I choose skin friendly jewelry from Blomdahl? Contact allergies can develop at any time in life and you can for example become allergic to nickel if you use jewelry containing nickel. Approximately 20% percent of all women suffer from nickel allergy. Although nickel allergy is the most common type of contact allergy, jewelry can contain many other allergens, such as cobalt, gold, epoxies and acrylates. They may also contain toxic, carcinogenic or otherwise unhealthy substances, such as lead, cadmium, formaldehyde, phthalates and bisphenol A (BPA). Blomdahl skin friendly jewelry is developed in consultation with skin specialists to be suitable for everyone who wants to avoid contact allergies and other health risks. We use only the safest materials. Blomdahl is recommended for children and adults who want to be able to wear jewelry every day, without having to worry about their skin and health. What materials make our jewelry a safe choice for all, even for those with allergies? For earrings, you can choose from carefully selectedtitanium and plastic, of pure medical quality. Our coating is only applied to the portion of the earrings that don’t come into close contact with your skin. The part of the earrings which are constantly in contact with your skin are always made from pure, medical titanium. Bracelets and necklaces from Blomdahl have a beautiful and skin friendly gold or silver colored coating which has been applied on high quality surgical, stainless steel (316L). As chains and pendants do not sit as close to the skin as rings, earrings do, they can be completely covered with our skin friendly coating. To protect your skin and your health, Blomdahl uses a coating that has been developed in consultation with skin specialists. This unique, ceramic (durable) coating makes the bracelets and necklaces up to 300 times safer, compared to the same jewelry without this coating. Therefore our skin friendly jewelry is suitable for everybody, even if you have nickel allergy. All our skin friendly jewelry comply with 2004/96/EC (“The EU Nickel Directive”), and the limits for cadmium and lead as stipulated by EU regulation, (REACH). Furthermore, we have gone further than required by the regulations, i.e. the nickel content and/or the nickel release is 0 % or so close to 0 %, that our jewelry cannot cause nickel allergy. Remember to handle your skin friendly jewelry carefully. That way it will stay beautiful for longer. When you don't use it, keep the jewelry in a Clean Pack. Remove your jewelry when showering. Avoid exposing your jewelry to makeup, hair care products, alcohol and other chemicals. In order for your jewelry to retain its shine, remove and clean it with uncolored soapy water regularly. For earrings made out of medical plastic, this also means that the earring backs will be more secure. Earrings made out of medical plastic are usually quite resistant, yet the posts, hooks and pendants are soft and need to be handled carefully. Do NOT clean medical plastic earrings with alcohol or peroxide. In order to make the titanium earring backs tighter and therefore more secure, press the loops of the earring back slightly together before use. Why is all jewelry from Blomdahl delivered in hygienic packaging? In order to guarantee that you are the first person to come into contact with your new jewelry, we deliver it in our Clean Pack. It keeps the jewelry hygienic until the packaging is opened. The label acts as a seal. Even if jewelry is marked nickel-safe/nickel-tested/nickel-free, it does not mean that it is entirely free of nickel. This is because nickel is present in virtually all metals, sometimes as a mixed in ingredient and sometimes as a contaminant. The EU Nickel Directive (2004/96/EC) limits the amount of nickel that jewelry is allowed to leak. However, even if these guidelines are being followed, people who are extra sensitive are still at risk of developing nickel allergy. If you use Blomdahl you will not have to worry about nickel, cadmium, lead or any other harmful substances. Our jewelry is developed in consultation with skin specialists to be suitable for everyone, even those who suffer from allergies. What makes ear piercing with Blomdahl safe? Medical ear piercing from Blomdahl is based upon what within the health care industry is known as “modern aseptic technique” and is carried out using sterile disposable products. This means that our products and methods are safely designed in order to avoid the spreading of infections when piercing. Our piercing earrings are developed in consultation with skin specialists to be suitable for everyone, even those who suffer from allergies. 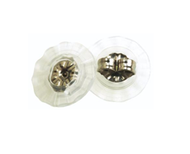 You can choose between carefully selected plastic and titanium of pure medical qualities. The piercing earrings are designed to facilitate the healing process. For instance, the earring backs on Blomdahl piercing jewelry are always fixed at the tip of the post where it encapsulates the tip. The piercing jewelry is also designed to make the hole slightly wider in the beginning, which eases the switch to normal earrings after the healing period. Our quality-assured manufacturing takes place in Halmstad, Sweden, in accordance with ISO 13485, an international quality standard for medical devices. This means that we have full control and traceability over all stages of production, from materials used to finished product. How is an ear piercing carried out? Watch our video to see how an ear piercing is carried out in a safe way using Blomdahl. Why is it so important to choose safe materials when having your ears pierced? Approximately 15 percent of all women suffer from nickel allergy, which is the most common form of contact allergy. Contact allergies can develop at any time in life, and an ear piercing makes the skin more vulnerable to inappropriate materials, such as nickel, gold, palladium, cobalt and so on. That is why Blomdahl use only the safest materials. Our piercing earrings are developed in consultation with skin specialists to be suitable for everyone, even those who suffer from allergies. You can choose between carefully selected plastic and titanium of pure medical qualities. Pure medical titanium is the safest metal. It is the same type of material that is used for medical purposes, for example in dental implants. Therefore, if you wear earrings made from pure, medical titanium, you will not have to worry about nickel and other harmful substances when having your ears pierced. Pure medical plastic is unique in that it contains 0% nickel. It is made of the same type of material that is used to sew the skin, so called skin sutures. It has been used for over 40 years within the health care industry and there are no reported cases of allergy. Therefore, if you wear earrings made from medical plastic, you will not have to worry about nickel and other harmful substances when having your ears pierced. How do I take care of my newly pierced ears? An ear piercing is in fact a small wound. It is important to take proper care of it throughout the healing period (approx. 6–12 weeks), in order to avoid it getting infected. By following the aftercare instructions, you can minimize the risk of infection. In the written aftercare instructions you are advised to clean the hole thoroughly twice a day, using soap and water or Blomdahl Piercing Aftercare cleansing swabs, which are gentle on the skin and easy to use. Watch our video on how to clean a newly pierced ear. Why should I avoid rotating/twist the piercing earring? A common misconception is that, if you do not rotate the piercing earring, the skin will get stuck to it. This is not true. What is true is that rotating the piercing earring without first having cleaned your ear, earring and hands thoroughly, can infect the ear piercing. When can I remove the piercing earring? If you have had an earlobe pierced, you can remove and replace the piercing earring after 6 weeks, at the earliest. It takes longer for a hole in the cartilage to heal, so if you have had your cartilage pierced, we recommend that you leave the piercing earring for at least 12 weeks. How do I remove the piercing earring? To remove the piercing earring: Wash hands and ears thoroughly. A good time to remove the piercing earring is right after a shower/hair wash. With one hand, take hold of the jewelry part (front) of the piercing earring. With the other hand, take hold of the earring back and wiggle it back and forth, until you feel it loosens. Carefully remove the piercing earring and insert a clean earring. Piercing earrings are only intended to be used during the healing period. What should I bear in mind after having replaced the piercing earrings with normal earrings? Always wear earrings. If you go without, the holes can shrink and/or close completely. Take extra care when changing earrings. The skin that has grown within the holes is still thin and delicate and can easily tear, which may cause an infection. Therefore, always make sure to wash your earrings and your hands before the change, and make sure that the area around the holes is kept clean, dry and airy. If you use earrings with earring backs, these should not be pressed tightly against the back of the ear. The risk for developing a contact allergy is at its greatest during the first year. This is why it is extra important to wear safe earrings during this time. In consultation with skin specialists, Blomdahl has developed skin friendly jewelry suitable for everybody and especially for those who have just pierced their ears. Where can I get my ears pierced with Blomdahl? I am a medical professional interested in Blomdahl Medical Ear Piercing. How do I get started?